Ionic Security, a start-up based in Atlanta, announced $9.4 million in Series A-1 funding for its unified cloud and mobility security platform for the enterprise. Founded in 2011, Ionic Security (formerly Social Fortress) combines identity and access management, data-centric policy enforcement and comprehensive usage auditing to provide enterprises with an unprecedented level of control of their data without the need for, or use of, gateways. Administrating Ionic Security's Fusion platform is done through simple dashboards, tablet-oriented UI and a powerful correlation and policy engine while end-users see no change to their workflows. The funding was led by Kleiner Perkins Caufield & Byers (KPCB) and included Atlanta-based TechOperators and increased participation by early investors such as famed security entrepreneurs Ken Levine and Dr. Paul Judge. "Enterprises want to take advantage of the reduced costs and increased usability of cloud and mobile applications, but hesitate due to security concerns," said Steve Abbott, Ionic Security CEO. "Our Fusion platform provides the security controls executives need to approve cloud migrations, especially in regulated environments. Customers see lower costs, higher employee satisfaction and increased security." Researchers at the University of Illinois have developed new microbatteries only a few millimeters in size. The batteries feature an internal three-dimensional microstructure that allows for significantly faster charging and discharging -- about to 1,000 times faster than conventional batteries, out performing even the best supercapacitors. The researchers see potential applicability in microelectronics. VimpelCom has sold its entire indirect stake in Sotelco Ltd. in Cambodia to its local partner, Mr. Huot Vanthan. Financial terms were not disclosed. Jo Lunder, Chief Executive Officer of VimpelCom, commented: "We have previously outlined our Value Agenda within which our operations are reviewed to assess their future value to the Group. The decision to sell our interest in Cambodia is a result of this process. We are happy that our long term partner in the company now takes control of the business in Cambodia." VimpelCom, or its invested partners, currently serve 214 million mobile subscribers on a combined basis in the following countries: Russia, Italy, Ukraine, Kazakhstan, Uzbekistan, Tajikistan, Armenia, Georgia, Kyrgyzstan, Laos, Algeria, Bangladesh, Pakistan, Burundi, Zimbabwe, Central African Republic and Canada. Seaborn Networks, which operates the Seabras-1 cable system linking the US and Brazil, is establishing its first Brazil gateway in Equinix's International Business Exchange (IBX) data center in Sao Paulo, Brazil. 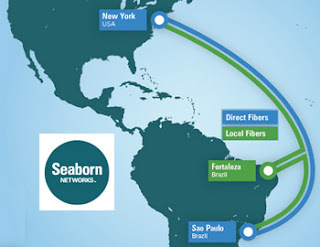 Seaborn Networks' Brazil – US submarine cable is a four-fiber pair, 32 Tbps system that will offer the first direct route between Sao Paulo and New York City. "Seaborn understands the importance of leveraging strategic points of presence in key metropolitan areas," said Larry Schwartz, CEO of Seaborn Networks. "We selected SP2 as our first gateway from Brazil to the US because it provides us with access to the single largest concentration of carriers, content providers and other companies that require a direct route between Sao Paulo and New York City."